It doesn’t come much better than the location of the most famous golfi ng scene in fi lm. 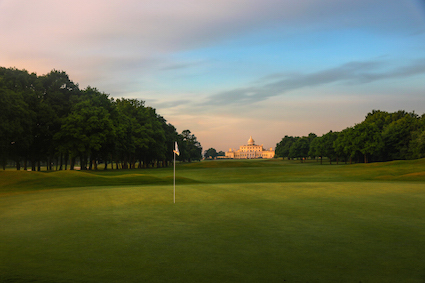 Stoke Park was the setting for that round of golf in 1964’s Goldfi nger, when the title character and Oddjob, try and fail to get one over James Bond with a little sleight of hand. What’s more, the 7th hole here was the inspiration for Augusta National’s 16th, where Tiger Woods memorably chipped in from the fringe on his way to Masters victory in 2005. Today, the 27-hole course, originally designed to fi t seamlessly with the Capability Brown landscaping, remains in fi ne fettle and is complemented by a host of modern facilities — from a spa with 11 treatment rooms, to hot yoga and group cycling studios, a sauna, steam rooms, swimming pool and 13 tennis courts.